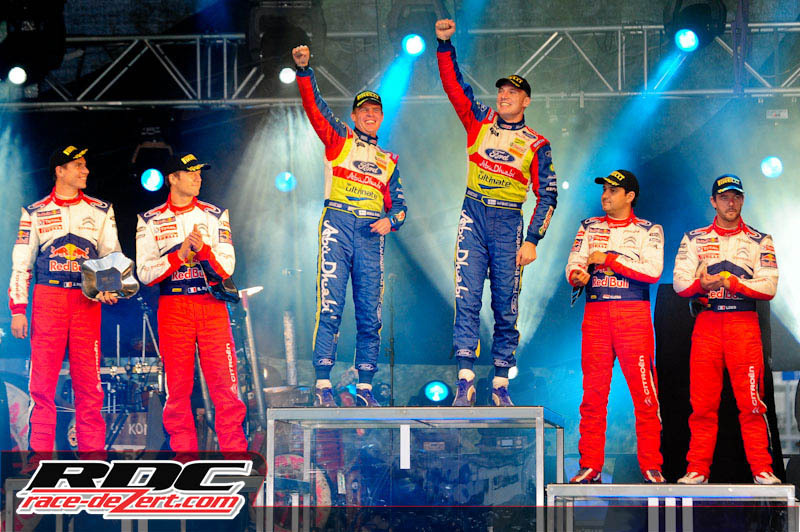 The World Rally Championship (WRC) resumed last week in Jyvaskyla, Finland for round eight of the championship. The 2010 rally also marked the 60th anniversary of Rally Finland and many vintage rally cars from Skoda, Volvo, Audi and more were brought out for everyone to enjoy. While it was held more than 5600 miles from Baja the countries and events have more in common than you might think. Jyvaskyla sits 160 miles north of Helsinki, the Finnish capital city in what is known as the lake region. While driving through the countryside you constantly pass postcard perfect lakes and cabins every few miles. The area conjures up thoughts of Lake Tahoe, northern Minnesota and the pine forests of Baja with similarities to each area. Traditionally the rally is held over three days but this year the rally would be condensed into a two day event with 19 special stages that covered 310 kilometers or just under 200 miles. The racers started their recce, prerunning to us, earlier in the week and the cars got their first taste of dirt at speed on Thursday morning with the Shakedown stage. The Shakedown is a chance for everyone to drive a stage in their racecars and make any last minute adjustments to the setup of the cars. The stage is open for four hours with most drivers taking at least four runs through the 4.7km stage. Mikko Hirvonen turned the fastest time of the day with a 2:02.2 besting his Ford teammate Jari-Matti Latvala by one tenth of a second. While the stage does not count towards the official results it is an indication of each drivers speed. The race officially started on Thursday night at 6:45pm Laajavuori 1, a 4.19km stage that started with an asphalt jump followed by a paved trail racing up the face of a ski run before turning to dirt. With Finland being so far north starting late is not an issue with lighting. In summer the sun does not set until 10:30pm and the skies stay light until well after midnight and start to brighten again about 4:30am. Privateer driver and double World Champion Petter Solberg (NOR) jumped out to an early lead taking the stage win by one second over local favorite Mikko Hirvonen. 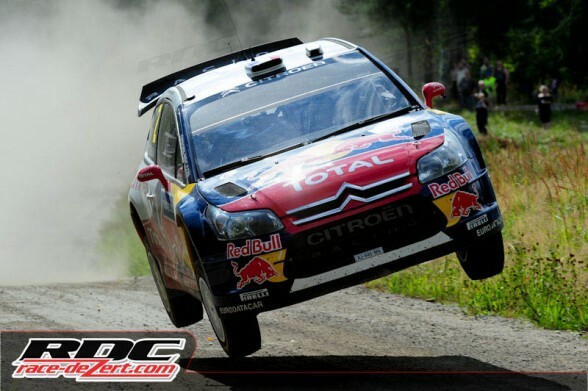 Loeb finished a further six tenths behind Hirvonen. Tens of thousands of fans came out to watch their favorite drivers tackle the stage and due to limited parking most walked for miles to get there. Finnish rally fans passion for the sport rivals the locals of Baja in both fervor and dedication. Day 1 of the rally continued on Friday with special stage 2 – Urria 1, a 12.7km stage. The first car would appear on the stage at 07:42am but by 6:00am the crowds had started to gather with many fans enjoying a few beers and grilling food much like their counterparts in Baja. The stage took racers past yet another picture perfect lake and cabin. In front of the cabin was picnic table built from large logs that the owner put together in under 2 days, impressive to say the least. The friendly locals were quick to offer me some homemade licorice type drink and after trying one I wished I hadn’t. Hirvonen got down to business and won the stage by 2.1 seconds over Latvala, with Loeb in third again. Hirvonen won SS3 as well giving him 4.9 seconds over P. Solberg at the conclusion of the stage. Things were looking bright for the Finn with solid performances on the early stages but all of that would soon change. 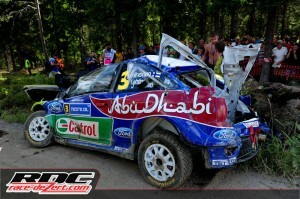 Hirvonen's car after the big crash that ended the rally early. Stage 4 was Urria 2; the second time though the stage. The stage featured several large very high speed jumps similar to what we find at Ojos Negros but smaller with speeds of close to 100mph. Feeling confident Hirvonen was flat out through most of the stage and as he hit the big jumps. While the first passed without incident the second is right on the apex of a right hand corner and he got a bit out of shape on the landing and hit a large berm sending his car into a massive roll and crash flipping the driver five times and peeling the co driver’s door right of the car for a classic desert yard sale. The ferocity of the crash was more than enough to take Hirvonen out of the rally but amazingly the cage held up remarkably well and both occupants walked away with no serious injuries. 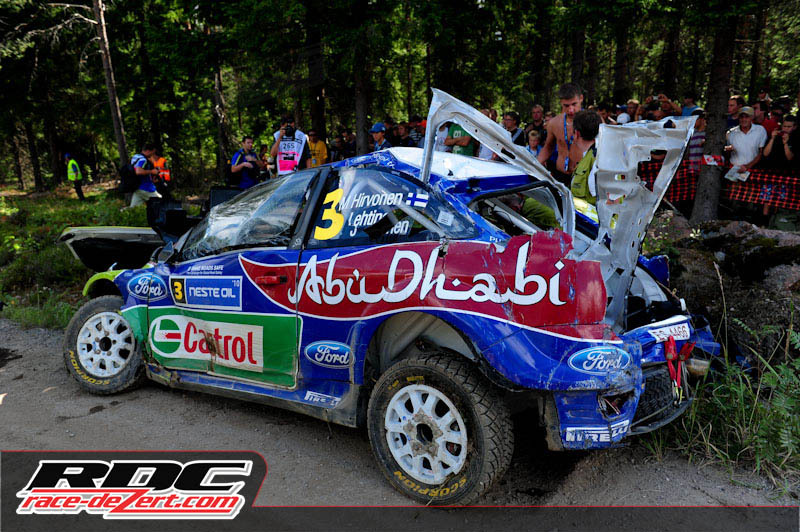 Hirvonen’s crash sent opportunity knocking on the doors of both Latvala and P. Solberg. Solberg held off Latvala for the next two stages and was looking good until being overtaken by the Finn. The battle at the top of the leaderboard was intense throughout the day and Ogier, who started the day in fifth position, battled hard with his fellow Citroën drivers to climb to third overnight. Reigning World Champion Sébastien Loeb struggled in the morning stages when he damaged the front bumper on his C4, seriously affecting the aerodynamics of the car. He recovered from fifth position to fourth by the end of the day, just 11.7 seconds ahead of Dani Sordo. At the conclusion of Day 1 Latvala held a 9.1 second lead over Solberg. Being at the front of the pack would be a bit of a disadvantage for Latvala, as he would be first off the line on each stage of Day 2 and having to deal with loose conditions as he cleaned the road for fellow drivers. Luckily for Latvala there was a lot of rain overnight which helped pack the racing surface and bring up grip levels for his run to the finish on Day 2. The two day format of the rally really put the screws to drivers but especially to the crews. The top drivers would not return to the service park until 8:30pm at the end of Day 1 for repairs and have to leave again at 5:50am the following day for the 99km drive east of Jyvaskyla for the start of SS12. Young gun Ogier wasted no time getting to work winning SS12, a short 10km stage by one second over Latvala but on the 29km SS13 the old master Loeb was back in the saddle to take the win by 1.7 seconds over Ogier and by 7.3 over Latvala. From there the drivers head back towards Jyvaskyla for SS14 – Surkee 1, a 19km stage that again had massive crowds out to watch. Latvala wicked it up and took he win by 7.3 over Ogier and improved his overall lead to 22.5 seconds. Loeb fell back again to third with Solberg fighting the good fight in fourth. Loeb came on strong again winning stages 15 and 16 to move up into third overall while Latvala faltered on both stages cutting his lead to just 12.3 seconds over Ogier. The final three stages would be repeats from earlier in the day and with 60km to go Latvala would be in the hot seat to hold on to the lead. On SS17 Ogier further cut into Latvala’s lead winning by 1.7 seconds over the Finn, but Latvala would not be deterred and he came back to win SS18 by 0.5 seconds over Ogier all but securing his victory. Ogier claimed victory on SS19, the final stage, by 0.8 over Loeb and a full second ahead of Latvala but it was not enough. After two days of intense competition, Jari-Matti Latvala and Miikka Anttila won their home round of the FIA World Rally Championship, Rally Finland. 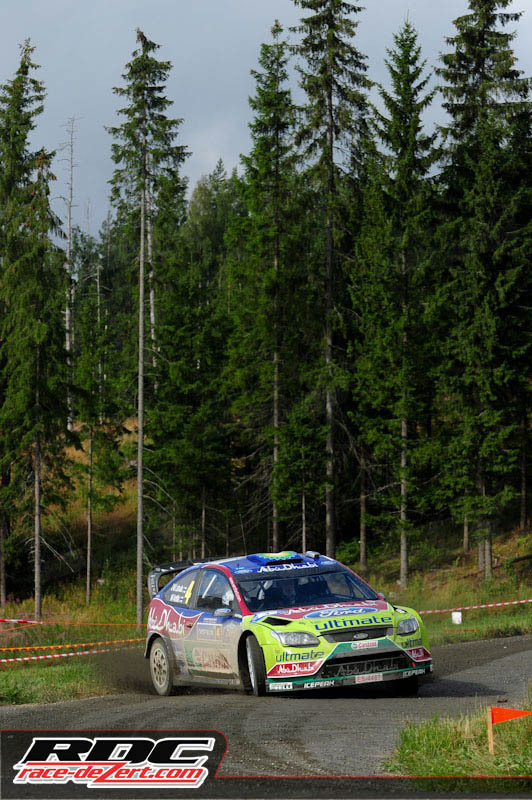 The Finns held off a trio of Citroëns to beat Sébastien Ogier and Julien Ingrassia by 10.1 seconds, and his third-placed team-mates, reigning World Champions Sébastien Loeb and Daniel Elena. The win gave Latvala enough points to move into third in the championship with Loeb first and Ogier second. The World Rally Championship will resume on August 19 with the all pavement Rally Germany.